February is Pet Dental Health Month, but we should be conscious of our dog's oral health all year long. Poor dental health in pets can lead to more serious health issues. Whiter teeth and the absence of bad breath in my dog are great, but good oral health for dogs goes deeper than that. If a dog has poor oral health it can lead to dental disease, especially periodontal disease which can lead to more serious health problems. Toxins from periodontal disease get absorbed into the dog's blood stream and can cause infections in the body. This can potentially damage kidney, heart, and brain tissue. Good Pet Oral Health isn't just about fresh breath and whiter teeth, it's an important part of your dog's overall health! This post is sponsored by Oratene® . I am being compensated to help share information about Oratene Brushless Pet Oral Care products for Pet Dental Health Month, but we only share information we feel is relevant to our readers. Many kinds of bacteria can grow in your pet's mouth. The mouth is moist and dark, a perfect place for bacteria to flourish. Bacteria such as plaque hardens and becomes tartar, which can throw off the balance of normal, healthy microbial flora in your dog's mouth. This can ultimately lead to dental disease. When we adopted Phoebe at age 5 her teeth were already in poor shape. Pets taking medications are especially prone to dental health issues. Some medications can cause a condition known as "Dry Mouth". Although pets may still have saliva and drool, the quality of the saliva is poor. Pets with chronic Dry Mouth can develop severe halitosis (very bad breath), and tooth decay. According to both the American Veterinary Medical Association (AVMA) and PetMD, nearly 80% of dogs over the age of 3 have dental disease. It's the most common health problem effecting dogs. 🐶 Periodontal Disease; one of the most common diseases in dogs, it causes damage to the gum, bone, and tissue around the teeth. 🙀 Gingivitis; an inflammation and infection of the gums. When I adopted Phoebe she was about 5 years old. From the start her teeth weren't good. I was nervous about getting her a dental cleaning because in order for pets to have a Veterinary dental cleaning they need to be put under anesthesia. That scared me and I didn't want to take the chance. I tried to brush her teeth but it didn't work well, she hated it. I was really happy when I found Oratene water additive, which helps prevent plaque and remove biofilm. I hoped the water additive, along with dental chews would help me avoid a dental cleaning for her altogether, but it was too late, her teeth were too far gone. Although it helped both my dogs bad breath a lot, the damage to Phoebe's teeth could not be undone. Phoebe's beautiful pearly whites after her cleaning at the Vet. At 8 years old one of Phoebe's teeth fell out for no apparent reason. After that I bit the bullet and took her to the Vet for a dental cleaning. I'm so glad I did because she ended up needing to have 6 teeth pulled! I felt so bad that she had to go through the stress of a Veterinary dental cleaning, anesthesia, and having to stay at the Vet all day and into the evening. I vowed to make her first Veterinary dental cleaning her last by using Oratene's Brushless Oral Care Toothpaste Gel and water additive! After her dental cleaning, I made a more serious effort to use both the Oratene Brushless Toothpaste Gel and Water Additive daily. Phoebe never accepted me brushing her teeth, she just hated it too much. Rather than continuing to struggle getting her to accept a toothbrush or finger brush, I tried Oratene's Brushless Toothpaste Gel. Yes, that's right, I said Brushless toothpaste! You just apply the gel to your dog's gums once or twice a day. The pet's saliva works to get the toothpaste to all parts of the mouth without brushing. No more struggling with an uncomfortable brush in Phoebe's mouth. The toothpaste gel and water additive are safe for use on both dogs and cats. That's such a convenience, you don't have to keep two sets of pet dental care products for your dog and cat, they can share! Fortunately, Phoebe didn't have much of an issue with me sticking my finger in her mouth, it was the brushing she hated. I took the time needed to have her get used to me applying the gel to her gums. It was a much easier process than I feared! I make sure to give her a small treat afterwards so she knows that the toothpaste gel leads to a TREAT! I think she almost looks forward to it! I'll continue using Oratene's Brushless Toothpaste Gel along with the Oratene Water Additive, and hopefully Phoebe won't have to get another dental cleaning for the rest of her senior years. Oratene's Brushless Pet Oral Health Products help keep your dog's teeth clean and prevent dental disease. They make it easy to kill harmful bacteria and germs, and remove plaque biofilm in your dog's mouth to restore oral balance. Oratene's oral care products use two patented enzyme systems not found in other enzymatic oral care products to boost the natural oral flora, help protect against gum disease and dissolve plaque biofilm, and inhibit the bacteria that cause bad breath. > Oratene brushless oral care products contain two patented, natural enzyme systems, the LP3 Enzyme System and the MD2 Enzyme System (Mutanase + Dextranase). Oratene Water Additive for pets is easy to use. Just 2 cups of water + 2 pumps of the additive in pets water bowl daily. > These enzymes inhibit harmful odor-causing bacteria and remove plaque biofilm. The LP3 Enzyme System destroys bacteria and fungal microorganisms while restoring the oral balance in a pet's mouth. The MD2 Enzyme System makes plaque water soluble and unable to bind to the teeth. > Oratene Oral Care products do NOT contain CHLORHEXIDINE, XYLITOL, ALCOHOL, OR DETERGENT, and is safe for dogs and cats to use daily! Note: According to Oratene, the Water Additive can be used in a pet water fountain however "the filter MUST be taken out or it will remove the active compounds, and it will plug up the filter." WIN AN ORATENE BRUSHLESS ORAL CARE FOR PETS PRIZE PACKAGE! Zymox Oratene Brushless Oral Care for Pets PRIZE PACKAGE; Toothpaste Gel, Water Additive, & Breath Freshener! 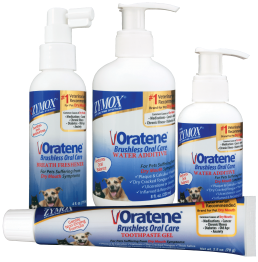 If your dog is taking medications, or if you just want to improve your pet's oral hygiene and bad breath, give Oratene Pet Dental Health Products a try. Oratene Brushless Oral Care products for pets are safe for both dogs and cats! Zymox also offers a complete line of skin care products for pets. If your pet suffers from allergies, Hot Spots, Hair Loss or general poor coat condition Zymox has a number of products that may help. They also offer products for wound care and skin infections. Fortunately, I haven't had a need for skin care products for Icy or Phoebe. They don't have allergies or other skin issues. What do you think about the convenience of a brushless oral care system for pets, is that something you would try? Leave us a comment and tell us! I try to keep the boys' teeth brushed on a regular basis. Bentley loves it! You're so lucky he likes teeth brushing, most dogs don't! Dental health for pets is so important. I brush Mr. N's teeth but I'm always interested in adding other methods as well. Thanks! I'm glad you like the post. Good for you Alice! It's so important, poor dental health can lead to serious other health problems. Ted tolerates tooth brushing but doesn't like it. After spending over $400 for his first cleaning I vowed to keep brushing! I lapsed for a few months and that's all it took for the plaque to build up on the back teeth and doggy breath. Back out came the toothbrush. I will have to try the water additive or brushless gel to supplement and make up for my "lazy" nights. It's a great idea when frequent brushing isn't possible. My dogs hate teeth brushing too, but I'll keep trying to get them to accept it. Yes, her teeth were in poor condition since we first adopted her. I'm glad I did the cleaning, now it's up to me to ensure her teeth remain in good condition! My dogs aren't fans of having their teeth brushed. We have had good luck with a water additive. That's great, I'm glad the water additive works well for you. I like both the water additive and the brushless gel for teeth. Oratene works! We loved the water additive because it's so easy to use. Perfect for the dog who hates to have their teeth brushed. Oh definitely, I love the water additive too as well as the brushless gel. My dogs hate teeth brushing too. That's so great, I'm glad you're able to get those teeth clean! I'll keep trying to brush but in the meantime these products are so helpful! I can only take pre-emptive measures like this Oratene. Brushing has to start when our fur families are small and they become accustomed to it. This is a great overview of dental care and we will share. I love the Oratene products, they really help so much. My dogs just won't accept the brush! This looks like a great product and easy to use. I know what you mean about the struggle to use a toothbrush with pets. Having a brushless option is a winner! Will share this info. Thanks for sharing, I really appreciate that. I love these brushless products, they are a Godsend when you can't brush! Ooh, I will have to check this out! My dogs are NOT a fan of having their teeth brushed. This looks like such a better alternative! Thanks so much for sharing, I had never heard of this brand before. Thanks Debbie. Most dogs hate teeth brushing, and these products are a great alternative. Like Phoebe, Ruby has always had issues with her teeth and doesn't like brushing very much either. Something about these little breeds are their teeth. Our former dog, Pip was the same way. I am glad to know the water additive is safe for dogs and cats as Ruby and Rosie share a water bowl (they have their own, but choose to share. LOL). I am sorry I missed this giveaway! I love these brushless products, they're so helpful. I feel much better, even if I can't brush I can still keep their teeth clean and hopefully prevent issues. Dental disease can lead to systemic issues; heart infection, kidney failure ... it is no laughing matter. You're so right Jana! it is really scary that poor pet dental health can lead to such serious health issues if it's left unchecked. I'm going to have to look at using this with my kitties. With their small mouths, it isn't always easy to brush their teeth. Manna is over 10 years old now and her dental needs are quite naturally becoming more likely to be a problem. It would be great to keep her mouth healthy as long as possible. I love that these products are useful and SAFE for both dogs and cats! I can't even imagine how difficult it must be to brush a cat's teeth. Yowie! I bet the brushless tooth gel would help Taffy a lot. The water additive did wonders for my dogs breath too, it took away all the odor. Give it a try, let me know how you like it. Wow, Phoebe, congratulations on such a beautiful smile. Although my guys are good about the oral sprays, the water additive truly is the best. It's so easy to use each time I top up the water. What a huge difference, right!? I'm so happy with her teeth now and I will continue using these products to help keep her teeth in good shape. They have a breath spray but I haven't tried that yet. I've only used the water additive and the brushless toothpaste gel. I will have to use this. Kilo hates going to the vet and having his teeth brushed. Plus I worry about anaesthesia on squishy faces. I try to clean a bit and he chews Bullwrinkles which remove plaque but this could be a good supplementary treatment. OMD, pet anesthesia scares the heck out of me! I avoid it for my dogs if possible. These products are so helpful, I'm so glad I found them! I've been extremely lucky that my cats haven't had problems with their teeth (over 40 years) but I do know the importance of oral care. I haven't tried Oratene yet, but it looks like something I need to look into. It really works great, definitely give it a try! When your dog flips, over a Bomb Cyclone!